Graham maintains a balance of client-facing delivery work and internal business operational management. Graham is responsible for EDW's infrastructure and service delivery, overseeing system administration and client support, and has a cross-functional role in sales, pre-sales, alliances and marketing. He is EDW’s customer advocate throughout all aspects of the customer lifecycle. 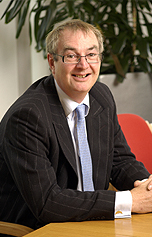 Graham has extensive experience in electricity retail market entry and business start-up. Prior to joining EDW Graham worked for electricity4business as its Sales and Marketing Director and before that Graham worked at Centrica in its B2B division. His roles included acting as Programme Director of the Centrica B2B transformation project, replacing all existing B2B systems with an integrated end-to-end solution. Previously Graham was at Electricity Direct where he was the Director responsible for Marketing and IS Solutions. Graham helped steer Electricity Direct from a privately owned start-up business in 1999, to a company with an annual turnover of in excess of £200m in less than 3 years and finally to the acquisition of Electricity Direct in 2002 by Centrica for £62m.